Despite some significant opposition to Apple’s push for HTML5 web development (and rejection of Flash on iOS devices), Adobe has in recent times made some significant moves to embrace HTML5 including the recent release of a Flash to HTML5 conversion tool. However this past weekend Adobe released Edge, a new piece of software that aims to help web developers create HTML5 web pages and animations. The move by Adobe is a significant one, and whilst at the moment is only in a ‘1.0’ beta, Edge will likely become a core piece of Adobe’s software repertoire. In its current form, Edge, is fairly limited to basic animations and can only handle a single page layout – however just like Adobe’s Dreamweaver, web developers can view and modify the code generated by Edge. TUAW, asking about integration with other Adobe products received a response that said integration would come, but at a later date. 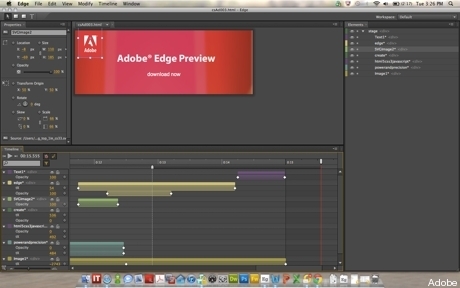 However despite the promise of Edge, Adobe remains adamant that Flash is not dying. Instead, John Cole, creative solutions architect at Adobe claims “Flash and HTML5 will co-exist in the long term” – despite also admitting that HTML5 “will be big”. You can download the first beta of Edge from Adobe's Lab website here.